Hiya guys! Like always, I want to start off by saying thank you for the warm wishes it means a lot. 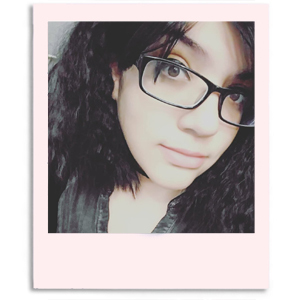 My anxiety has been nothing short of a roller-coaster, just a few more days left and I can put this all behind me. Now moving on and right into today's post. I'm so excited because it's a different type of service that I haven't ever touched before. 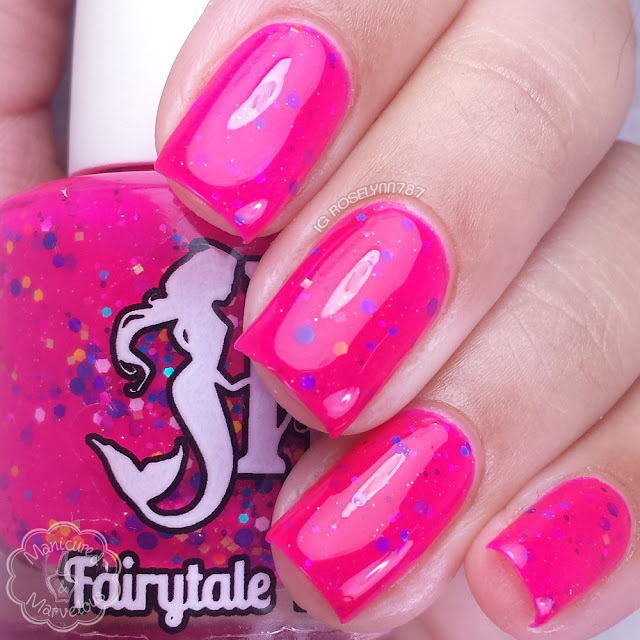 Fairytale Finish has launched their monthly subscription service called Neverending Fairytales and I'll be showing you what August had in store for us. The time window for the September 'Birthday Extravaganza' box ends on Saturday 8/29 at 5pm PST. Be sure to subscribe before times runs out! Obviously need more info and that's what I'm here to provide you with. NeverEnding Fairytales is indie polish subscription service that allows you to choose either one full-size bottle for $9 or two full-size bottles for $16 shipped. Every month there will also be a guest indie who will include additional products such as, but not limited to, vinyls and mani bombs. Once you're signed up, you'll be automatically charged every month after that on the same day as the month of your initial sign up. You may cancel or resubscribe at anytime. For September subscribers, all packages will be shipped at the same time to avoid spoiler alerts and unnecessary waiting. The box will be shipping no later than September 7th. If you wish to cancel your subscription, then your last day to do so will be September 5th. The box that I am showing you today is the August package, which was inspired by Baked Goods. Let me just say the package smelled amazing from the second I opened it! August's box included two full-size bottles and a couple products donated by the guest indie Lou It Yourself. Lou It Yourself is a nail vinyl and polish indie shop and their donation to this box includes two sets of vinyls and a Lemon Pound Cake mani bomb. I've had the pleasure of using their nail vinyls before and the quality is definitely top notch. I will be posting manis using these vinyls real soon because I cannot seriously resist them! 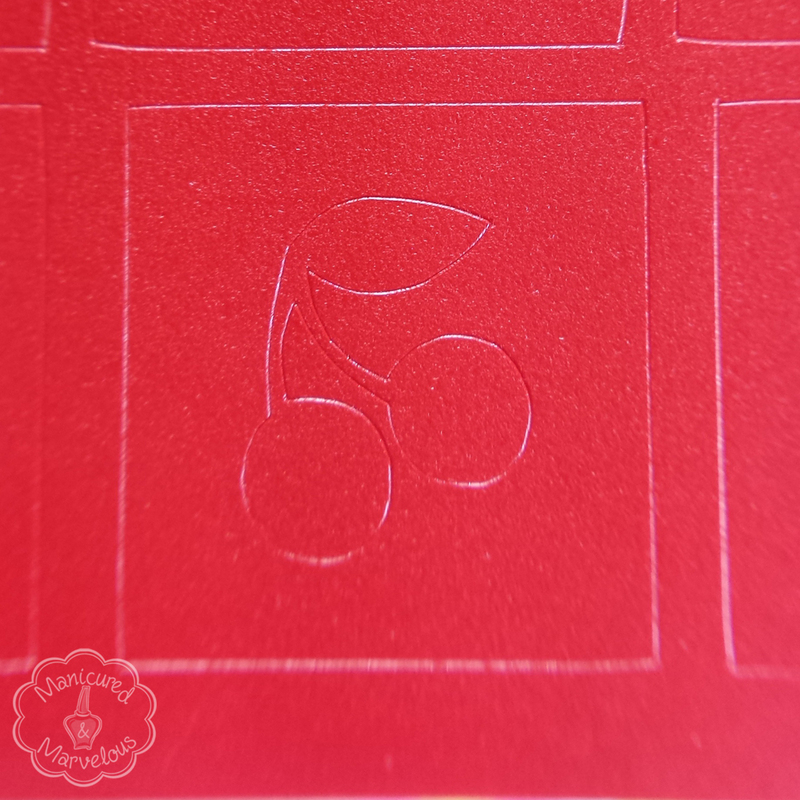 In theme with the box, the first vinyl that you'll see below is a cherry followed by a cupcake one. 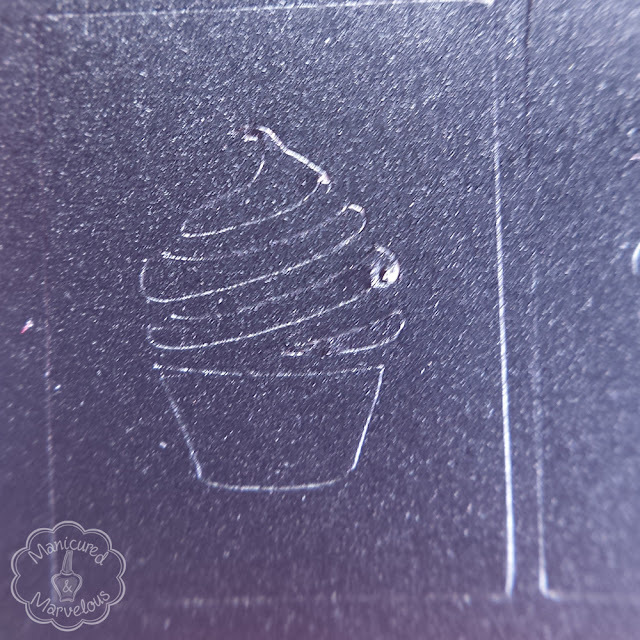 Very unique, I don't think I have ever seen cupcake vinyls before. Now let's get to the polishes! 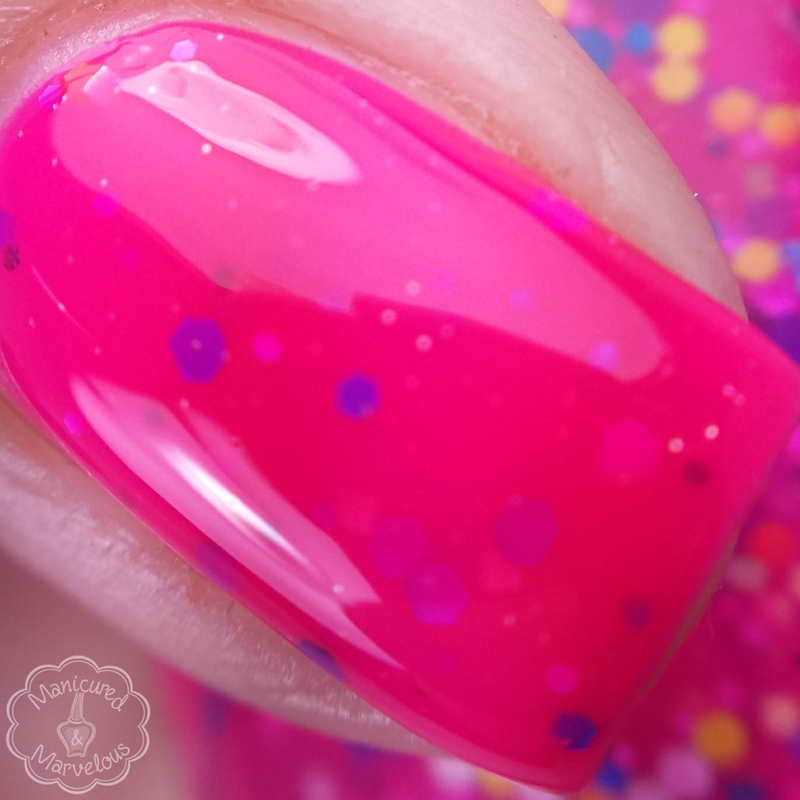 Triple Berry Tart can be described as a neon pink crelly filled with purple, blue, pink, and yellow hex glitters. Doesn't this just looks delicious? The color to glitter combination helps bring this color to life! I almost want to lick it, I really do. The squishy finish is too gorgeous to resist. The formula was really smooth and easy to layer. There was no need to fish for the glitters and I was able to dab a layer to fill in the gaps without any issue. Shown here is thee thin coats sealed with a glossy topcoat. 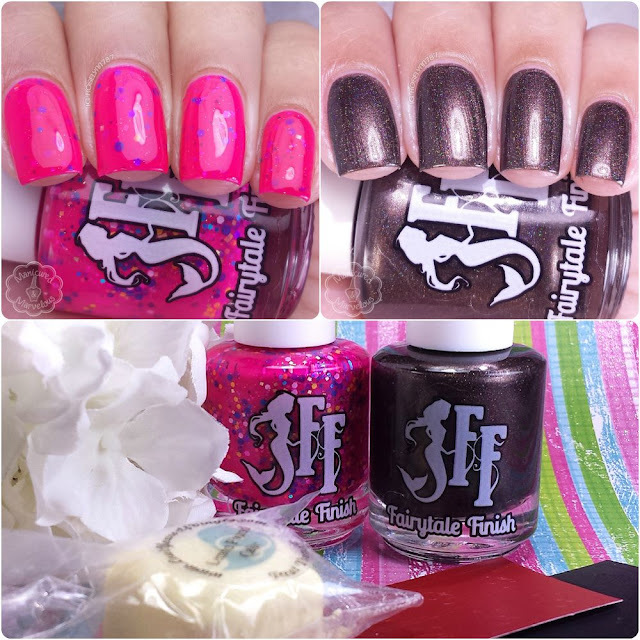 Choc Full O' Holo can be described as a chocolate brown holographic polish. Who isn't a chocolate fan, am I right?! And then you combine it with a holo and you basically have the birth of a baby unicorn. That's my only explanation for this gorgeous shade, haha. Seriously you don't see brown shades around very often and much less holo ones making this such a dream. Great formula and consistency in this polish as well. The coats were really opaque, which made the application super smooth and easy. Shown here is two coats sealed with a glossy topcoat. As I mentioned before, September's theme is going to be "Birthday Extravaganza" and it's sure to be even more amazing. Not only is the owner Amanda of Fairytale Finish turning 27, but it will also mark the one year birthday of this indies launch. Overall I haven't been part of a subscription box in a very long time, but I have to say this one won me over immediately. Not only do I find the price super reasonable, but the products are such high quality. Everything from the polish shades to the vinyls and even the mani bomb hit the theme dead on. I'm definitely looking forward to future boxes! I love that cool brown! That holo! I love brown nails in any finish but you know, holo! The two colors look great together!! And what cute vinyls!! Ohhh, both polishes are really pretty!! The vinyls are neat too! The box looks fun and you know just the fact it's all food themed makes me want it haha! Choc Full O' Holo.. woah! The name, the color, the finish, ALL perfect! Loving both of these so much! Beautiful swatches! Choc Full O'Holo is beautiful! I'm glad you're almost over the anxiety hump. That will be a big relief! Beautiful swatches! These are gorgeous! Loving Choc Full O' Holo! Beautiful shades and beautiful swatches! Thanks so much, it's definitely appreciated. Both of these polishes are amazing! 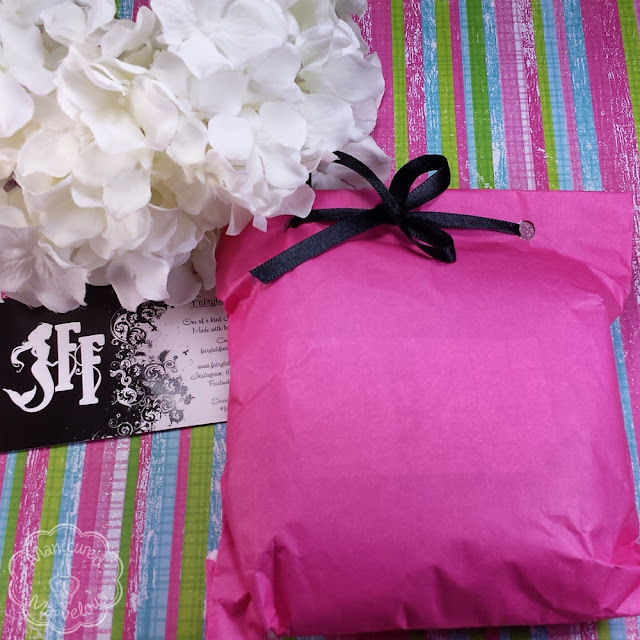 You can't go wrong with subscription boxes! Especially when they are so reasonably priced!